By now, you've all seen the epic Batman v Superman: Dawn of Justice teaser trailer that was released early on Friday. If you plan on seeing it in IMAX today, perhaps you'll also want to take a look at the recut version. Youtube user Bobby Burns has decided to give the impending DC Comic adventure a retro twist. Watch as he replaces Ben Affleck with Adam West and Henry Cavill with Christopher Reeve. This rebooted sneak peek features footage from the original 1978 Warner Bros. release Superman, which introduced the world to the mild mannered Christopher Reeve as Clark Kent, a superhero masquerading as a newspaper journalist in Metropolis. We also get to see footage from the hugely popular 1966 TV series Batman, which features Adam West as a more colorful Dark Knight. Together, the superheroes offer a funnier, more lighthearted take on this big brewing brawl that will play itself out on the big screen next spring. Henry Cavill and Ben Affleck star as the title characters in Batman v Superman. Reprising their roles from Man of Steel are Amy Adams as Lois Lane, Diane Lane as Ma Kent and Laurence Fishburne as Daily Planet editor Perry White. The cast also includes Gal Gadot as Wonder Woman, Jesse Eisenberg as Lex Luthor, Jeremy Irons as Alfred Pennyworth, Jason Momoa as Aquaman, Ezra Miller as The Flash and Ray Fisher as Cyborg, who will form the Justice League in the two-part adventure Justice League Part 1 and Justice League Part 2, set for release in 2017 and 2019. What do you think? 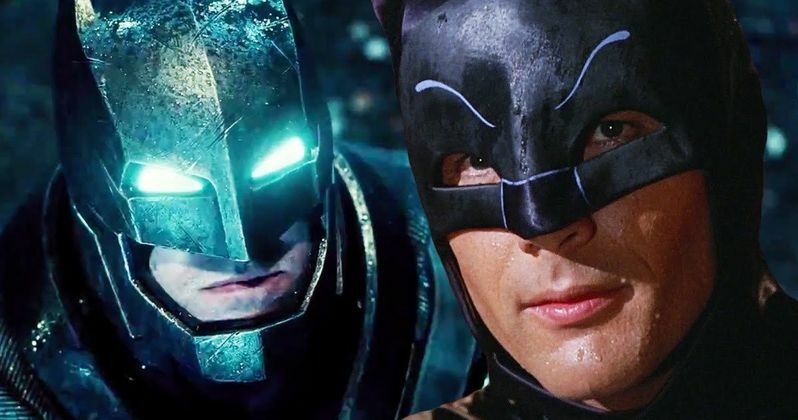 Do you like Christopher Reeve and Adam West version better?